A child hides in a ‘priest hole’ as her father is taken away to work on an evil Imperial weapon of mass destruction. Next seen fifteen or so years later, Jyn Erso (Felicity Jones) has been tracked down by the Rebels who want to use her to find her father and disrupt his contribution to the Empire. 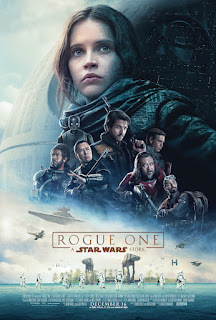 Soon Rogue One is bouncing between locations at a frightening rate, introducing characters from the (space) opera-sized cast who look familiar from TV drama before disposing of them with the flick of a switch on consoles that are so low tech that they use cathode ray tube displays. And so they escape from somewhere, they find someone, they fly somewhere, they break into someplace else and they climb up and up before experiencing dangerous passage over wire mesh walkways. Harrison Ford isn’t in this one so it doesn’t risk crossing over into the Indiana Jones franchise. Plenty of humour is squeezed in amongst the death and destruction. Even some of the dialogue feels knowingly cheesy. Every film in the ever-expanding franchise needs a droid, and K-2SO is a fine addition to the small fleet of metallic friends. He’s a little too honest and could well be related to Marvin the Paranoid Android, minus the depression. I’m no fan of Star Wars, but Rogue One is a pretty decent science fiction film, with space ships fighting, alien races, lots of running, and a universe dominated by English speakers. It tips enough of a nod to the more loveable Star Wars films with cameo appearances by any number of spoilerific characters. There are lots of familiar craft and paraphernalia. It turns out that Storm Troopers come in more than one colour and uniform. I bet the doll merchandisers are pleased with that creative decision! The plot essentially ensures that it is a standalone cast in a complementary storyline that explains some of the background in the original crawler text without messing with the canon. Whether or not a by-product of the 2D production that was later upgraded to 3D for people who like to wear glasses, there is a consistent visual style to the film that overuses shadows and keeps a very small depth of field to allow only a single actor to be in focus while blurring out everything else around them, even people quite nearby. You’d swear that many of the ships floating in space were models made of 1980’s Lego bricks of the exact shade of stone grey. The musical score is big, bassy and brassy right from the star, with fervent strings and drums beating to build up the tension. Orders? When you know they’re wrong you might as well be a Stormtrooper! So I’m still in command? … Be careful not to choke on your aspirations, Director. By the end, rather a lot of 'hope' has been thickly spread in a not so subtle pointer to the title of Episode IV: A New Hope.